Heat oil in large skillet or wok over medium-high heat until hot. Add bell peppers and onion; cook and stir 2 to 3 minutes or until vegetables are crisp-tender. Add corn, tomato, salt and pepper; cook until thoroughly heated. To serve, place 1/2 cup vegetable mixture in center of each warmed tortilla. Top with desired toppings; fold or roll up. To intensify the Southwestern character of this dish, sprinkle the vegetables with a bit of ground cumin or chili powder as they cook. 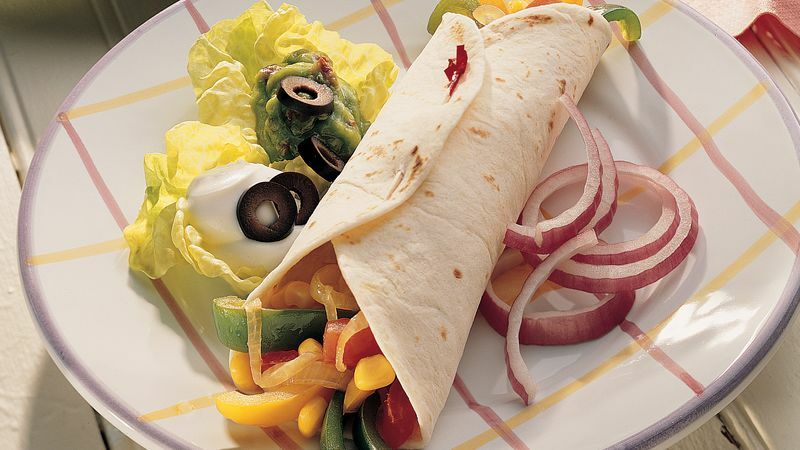 Fajitas are a big part of Tex-Mex cuisine, and nowadays are available at many Mexican fast food restaurants in America. Though they are traditionally served with skirt steak strips, these vegetarian fajitas ditch the meat but keep a lot of the ingredients that are typically paired with the steak. The most common veggies you’ll find wrapped inside fajitas are bell peppers and onion. This recipe has plenty of those, plus extra veggie goodies like corn and tomatoes. One of the best things about fajitas is that they are easy to customize to your taste, and can be topped with a variety of ingredients like guacamole, sour cream and/or salsa. Get inspired to make fajitas all of the time by browsing through all of our delicious recipes!